Smoked chicken seems intimidating, I get it, but one of my favorite ways to cook chicken is to smoke it. Smoking chicken is much, much easier than you might think. 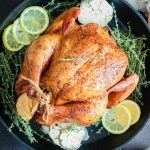 Smoked Chicken – the flavor is just out of this world – you’ll never cook a whole chicken any other way! We are barreling through 2019 and it’s time to start shaking off the winter cold with some grilling and smoked meats on our pellet grills! Traeger smoked whole chicken or chicken pieces (wings, breasts, thighs) just taste amazing when they are prepared this way. The enhanced flavor profile from the wood sends smoked chicken to a whole other level. I have an incredible recipe for smoked whole chicken below, but first some important information about smoking chicken. There are a couple of things you want to make sure you do when smoking a whole chicken. In order to keep the meat juicy, you should brine it beforehand. Using a mixture of salt, some type of sugar (we use honey in our recipe! ), and water, soak the chicken, completely submerged and store it in a refrigerator overnight. When the smoker is preheating take the chicken out and pat it dry, apply your choice of rub, then fill the cavity with aromatics. It’s important to really massage the rub in. You want it to coat the skin and stick. Lemon, garlic, onion, and thyme work great for filling the cavity. Especially when you serve the smoked chicken with a side of my Garlic Mashed Potatoes. Before you begin to smoke the bird, have the smoker preheated to 225°F. 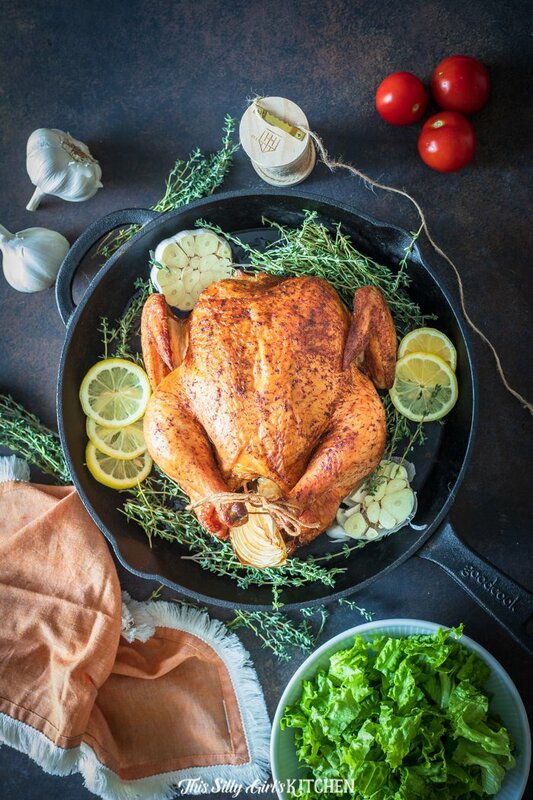 Depending on the size of the chicken, the cook time can take between 2.5 and 5 hours. This is why it is extremely important to accurately check the internal temperature. Exact timeframes can be off from smoker to smoker. Insert a meat thermometer into the thickest part of the smoked chicken breast for the best reading. Always make sure chicken reaches an internal temperature of 160°F. This is important because when you take the chicken out to rest it will continue to rise to 165°F. White meat chicken tends to start to dry out over 165°F. While this happens, it is a good time to start plating sides, like my Roasted Mushrooms with Garlic Butter Sauce. Smoking cut up chicken in a smoker requires similar steps to those involved in preparing a Traeger smoked whole chicken. For pieces of chicken, you should first brine them for up to an hour and pat dry. Rub on your choice of seasoning and then refrigerate for a couple of hours. When you get the smoker ready you may or may not use a drip pan, it mostly depends on the pellets you use. Traeger brand pellets contain moisture so no pan is necessary. Either way, using a water, or drip pan is completely up to you. 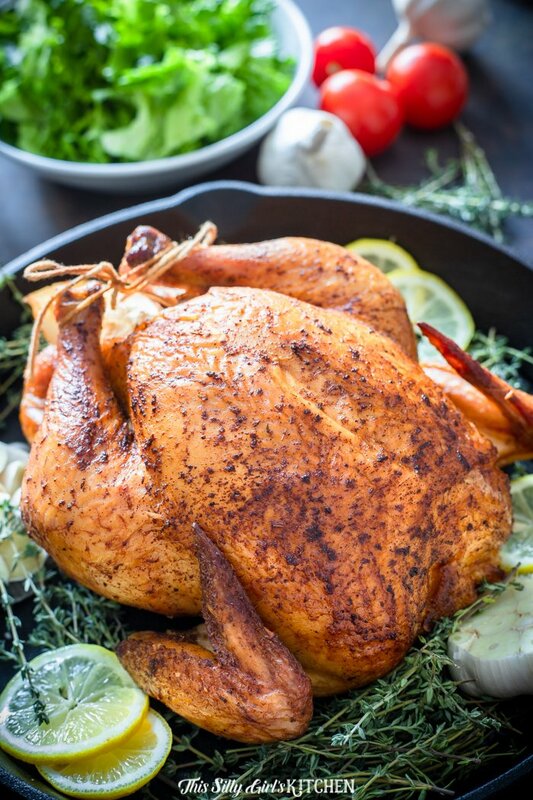 For pieces of chicken you will smoke at 250°F, a slightly higher temp then smoked whole chicken, because a quicker cook time results in moist pieces and less risk of drying out. Cook for 1 1/2-2 hours, check internal temperature to read 160°F. Dark meat takes longer to cook than white meat, particularly breasts. If you have both it is best to separate the pieces and check the temperature of both. If it’s game night, or another occasion where you all you want is wings, smoking them is a fantastic way to bring out new flavors and impress your party guests. I’m telling you, I have NEVER had a more flavorful wing then when we smoke them! Great chicken wings have a much shorter cook time and a higher temp. We still want to brine our wings before smoking, about 1 hour before cooking. While the smoker is preheating to 375°F, pat your wings dry and season with a rub of your choice and about a tablespoon of cornstarch. Cornstarch will help them to slightly crisp up, this is optional. Grill the wings for 30-40 minutes, turning half-way through. Check the internal temperature and allow the wings to reach 175° F for the best results. If you pull chicken wings at 165°F, they tend to be a little rubbery, yet still cooked through. The higher internal temperature of the smoked chicken wings results in much better texture. Use your favorite dipping sauce, and enjoy with a side of delicious Homemade French Fries! Leftover smoked chicken (if there is any! 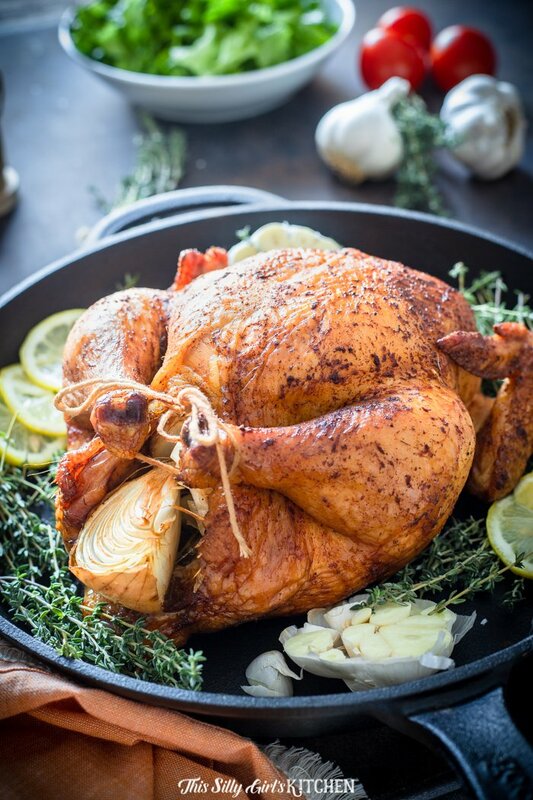 ), even smoked whole chicken can be frozen and last up to three to six months, if you store it properly. The trick is in how you wrap it up and how you warm it up later. 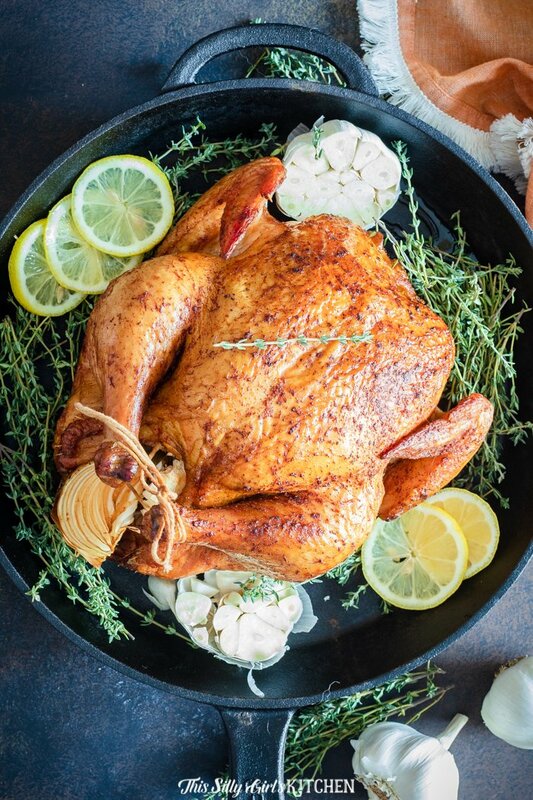 First, when freezing smoked chicken wrap it securely in sealed packaging, such as aluminum foil or plastic wrap and then place it into an airtight container or bag. I suggest allowing the chicken to thaw completely overnight in the fridge before reheating. When you take the frozen smoked chicken out to reheat, remove wrapping and wrap again in heavy duty aluminum foil. Leave a small opening on top but enough foil to close up tightly. Before resealing the chicken, drop in a tablespoon of water. Then heat your oven to 325°F and cook, periodically checking for the internal temperature to reach 165°F. This is a great tip to have on hand. It takes a lot of time and can take a lot of pellets to just cook one chicken. 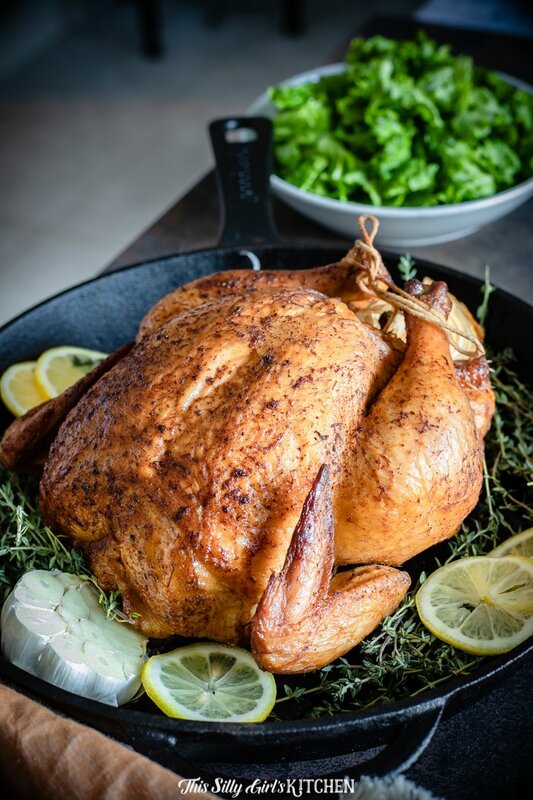 I suggest cooking multiple chickens at a time to get the most bang for your buck – and time! Such an easy entree will go great with an easy side dish like my Easy Parmesan Potatoes. In a large stockpot over high heat, add the water, salt, and honey. Stir to combine, cook just until the honey and salt are fully dissolved. Take off the heat and add the ice cubes. Stir until melted. 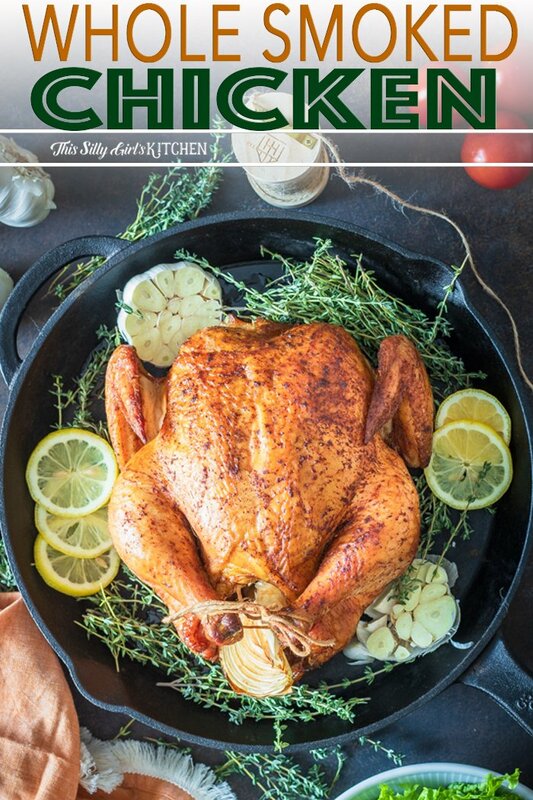 If the pot is large enough to hold the chicken, place the whole chicken directly into the pot with the brine. If it is not large enough, transfer the brine to a large container and add the chicken. Cover, and let sit in the refrigerator overnight. Before smoking, prepare your smoker per the manufacturer's instructions and preheat to 225°F. Take the chicken out of the brine and pat dry with paper towels. Sprinkle the rub all over the outside of the chicken and rub it into the skin. Stuff the cavity with the lemon, garlic, onions, and thyme. Tie the legs together with twine and place directly onto the grill of the smoker. Close the lid and smoke until the internal temperature when checked with a meat thermometer in the thickest part of the breast reaches 160°F. Take the chicken off the smoker and let rest for 15 minutes before carving. *granulated sugar or brown sugar works too.